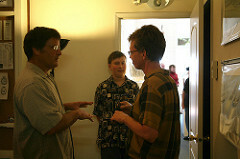 09.04.08 – Labor Day Weekend – The First Rural Design Collective Launch Party! 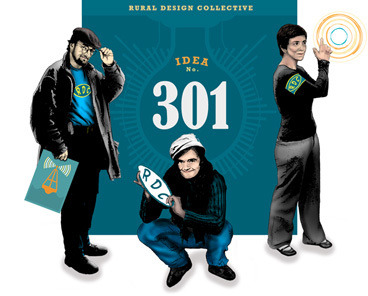 In the summer of 2008, two Rural Design Collective mentees independently built a promotional campaign web site for a budding community radio project, North Curry Community Radio. Working with NCCRadio director Linda Tarr, Nichole Richard focused on web development and project management, and Levi Thompson on graphic design. 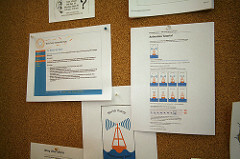 The team worked remotely using Skype, created tutorials, and participated in the press rollout, working with the local media and designing supporting print collateral for the marketing campaign. 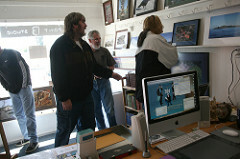 Although the project is in hiatus, it was a great pilot for the Rural Design Collective and a resounding local success. Besides being a lot of fun, it gave the RDC a well-defined community project to complete within the scope of the three month program. The entire experience was eloquently documented by Linda Tarr as a feature for the radio web site and christened with a launch party. Training materials were developed during the 2008 season by RDC founder Rebecca Malamud. These exercises will be added to the RDC UI Lab section of this site in the form of tutorials in the near future. Click This Bumper Sticker - Make Good Things Happen!